Steve Priest has announced a major update for OutdoorSteve.com. Search for pictures, tips, details, directions and references on OutdoorSteve.com. Never say, “I wish I had referred to outdoorsteve.com”. Click here and see what OutdoorSteve considers to be a “must” for an outdoor family. Bucket lists items can be a physical challenge (the 1.1 mile 18-inch-wide Knife Edge trail above the tree line with a GoPro chest camera and a 2,000+ foot drop). One Bucket List accomplishment was motoring a forty-foot houseboat through 17 of the 44 locks along the 240 mile Trent Severn Waterway, one of Canada’s most spectacular waterways. Compare my bucket accomplishment list to yours! Send me your bucket accomplishment list. OutdoorSteve has published 300 videos for local TV and blog posts. These videos are available by clicking Video in the left menu. Not sure where to go outdoors? Enter keywords in Search. See information on the Allagash Wilderness Waterway (AWW), the prime jewel of Maine’s wilderness areas, by entering the “Allagash” keyword. Send OutdoorSteve an email saying how OutdoorSteve.com made a difference in your outdoor life. Do a Testimonial. Bedford, NH –February 11, 2017 – Outdoor Play: Fun 4 4 Seasons Volume II, is Steve Priest’s fifth outdoor book. Follow Outdoor Steve and friends on their northern New England adventures of outdoor recreation. The book references Steve’s videos, places to go, preparations, routes, and narratives of each of his trips. Outdoor Play: Fun 4 4 Seasons, motivates and encourages families and individuals to make the outdoors a key component of their daily life. Linwood “The Loon” Parsons, Master Maine Guide, says, “Outdoor Play Fun 4 4 Seasons Volume II is Steve Priest at his best. The camaraderie and bonding that Steve has with his family and friends are apparent in all his writings. Steve’s writings on ‘Outdoor Play’ enthusiastically portray the entertainment of the outdoors. Travel with Steve and meet the challenges of outdoor recreation that are the cornerstone of his Outdoor Play: Fun 4 4 Seasons Volume II. Contact: For more information about Outdoor Play: Fun 4 4 Seasons Volume II, and Steve’s other books, please visit www.outdoorsteve.com. You can also call: 1-603-582-2413. Steve’s email is steve@outdoorsteve.com. BEDFORD, NH September 1, 2014 –Four friends paddled the Northern Forest Canoe Trail in the Adirondack and Saranac region of northern New York. They began at the Long Lake bridge paddling in a north-east direction and ended 42 miles and 3 ½ days later at the Village of Saranac. Their wilderness accommodations included two beautiful isolated islands in the middle of the Saranac Lakes. The trip had three very demanding portages totaling 11.5 miles and two hand-operated locks. BEDFORD, NH May 1, 2014 – Outdoor Play “Fun 4 4 Seasons” enthusiastically portrays a daily commitment to the outdoors for health and fitness. This book is full of short story adventures that give the reader an overview of multiple outdoor things to do. The message is to get outdoors and do something. The only competition you have is the task at hand. Do not worry about reaching the top of the mountain – just concern yourself with staying on the path. Places to Play in Northern New England chapter tells where to discover outdoor treasures. New Hampshire, Maine, and Vermont are emphasized for their unique outdoor offerings. The Great North Woods, Maine Island Trail, Appalachian Trail, and the Northern Forest Canoe Trail have references galore. Campsite tips, such as how to cook an egg in an onion, are present throughout the book. Paddling on exceptional waters, hiking, smart phone apps, giant pumpkin regattas, winter sleigh rides, triathlon clubs, indoor bike training, island camping, sea kayaking, axe throwing, and advice on preparing for the outdoors are amongst diverse stories shared. Black and White Paperback $11.95, 323 Pages, 250+ pictures. E-book $3.99, Full Color with web links. ISBN: 0985038403 and 0985038411 Outdoor Play “Fun 4 4 Seasons is available at http://www.outdoorsteve.com and http://www.amazon.com. CONCORD, NH October 20, 2012 – Bill Jennings, Program Manager for Bedford Community TV, presented Steve Priest a New Hampshire Coalition for Community Media Honors Award recognizing OutdoorSteve.com for a BCTV special, Apps for the Outdoors. Apps for the Outdoors: Smart Phone Technology for Fresh Air Activities is a streaming video movie demonstrating smart phone outdoor apps in your daily life. See your real-time hiking, running or walking pace. Know how far you just walked your dog. Find your biking miles for last month – and compare to the previous month and year. Want to map your canoe or kayak route? Integrate a smart phone app with your XC ski winter exercise. See the app your friends use to locate you immediately during a remote trek. These and more apps are available in Apps for the Outdoors. 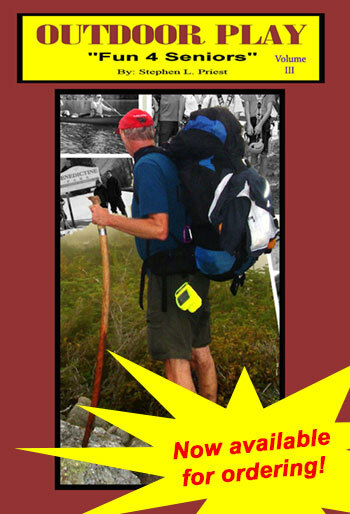 Outdoor Enthusiast Now Available in E-book Format! MANCHESTER, NH May 1, 2012 – For $3.99 you can download author and outdoor enthusiast Steve Priest’s Outdoor Enthusiast: Never say, “I wish I had…” from Kindle.com (ASIN B004S7EZLQ) and Nook.com (ISBN 9780615225050) onto your PC and portable e-book reader. The Outdoor Enthusiast e-book is also available for most e-book readers and smart cell phones. CONCORD, NH September 13, 2009 – New Hampshire author Steve Priest was a guest on Anita Hickey’s Book Swap Café, a weekly program on Concord Community TV. Steve’s latest book, Outdoor Enthusiast: Never say, “I wish I had…”, was reviewed by Hickey with Priest responding to topics such as individuals can, like the author, overcome self-made barriers and obstacles of health, physical, mental, and injury problems (e.g. “my knees are bad”, “I do not have a bike”, “I do not know how to start”, and “I have a sore ankle”). Outdoor Enthusiast: Never say, “I wish I had…” encourages individuals and families to get outdoors and be healthier both physically and mentally. Throughout the book, the “I wish I had…” phrase demonstrates bonding and learning through outdoor exercise. BEDFORD NH September 10, 2009 – Bill Jennings, Program Manager for Bedford Community TV, presented Steve Priest with a Certificate of Accomplishment recognizing his production of a BCTV special, “Enjoying the Great North Woods”. MIDDLEBORO GAZETTE April 9, 2009 – Decisions, a newly published novel written by Shaun Priest, has all the makings for a story that local residents could find interesting. Shaun was not a stranger to the business end of writing, though. He had watched his father, Steve Priest, go through the process several times. Steve’s latest book, Outdoor Enthusiast: Never Say ‘I Wish I Had”, includes as the subtitle his philosophy on life. Steve said he believes that going on outdoor adventures with his sons Shaun and Tim helped them to bond beyond the traditional roles of father and son. “In the wilderness you have to depend on each other working as a team, and certainly as an equal partner when danger is imminent,” he said. Shaun’s book Decisions is available through his website, www.shaunpriest.com and on www.Amazon.com. View the Full article at, Writing career is in the family .